Call me a cynic, but I figure a beta test conducted a month before a concrete release date is more than likely a marketing exercise rather than a genuine hunt for glitches and bugs. Either way, it means we get to play games early. Looking forward to next year? Check out the best PC games launching in 2017 here. 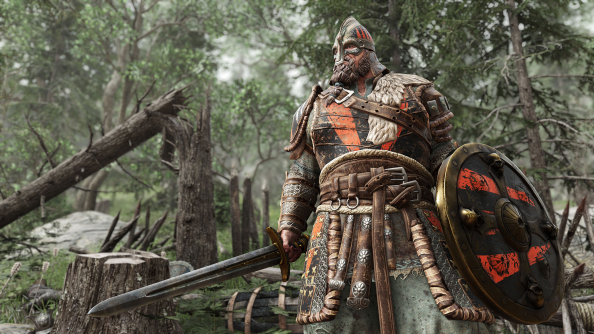 For that reason alone, I’m not going to complain about Ubisoft unveiling a closed beta test for For Honor, its hack-and-slash epic due to launch across platforms on February 2. The French giant has revealed said beta will run at some point in January, and is asking prospective players to sign up over on its website in order to take part. This isn’t just a cut and dry beta run, however. Ubisoft is coupling the beta with ‘War of the Factions’ – a pre-launch limited time event that publisher believes will answer the age old question, “When the mighty Vikings, Samurai and Knights finally collide on the same battlefield…who will reign supreme?” Yeah, that’s definitely something I’ve been losing sleep over. For Honor will offer 12 different heroes spread across the three aforementioned different factions; the Vikings, the Samurai and the Knights. So far it has cast light on three of these fighters, each one tied to a particular faction. I’ve dropped in a video for one of them, the Samurai allied Shugoki below. You can check out the trailers for the other two, the Warlord and the Peacekeeper, here. As an aside to all this, Ubisoft is also rolling out a meta game dubbed Faction War. Beta players will be asked to pledge themselves to one of the three factions, with every successful multiplayer battle they take part in earning War Assets for their group. You can sign up for the For Honor beta here. And make sure you pick INSERT COOLEST SOUNDING FACTION HERE, otherwise there will be trouble, ya here?